Key Difference: Rock is a solid material composed of grains of minerals. There are many different types of rocks. 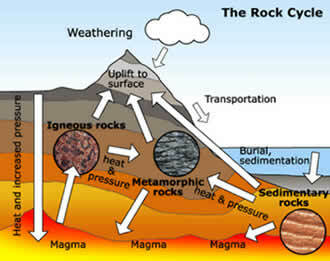 However, broadly they are divided into three categories – Igneous rocks, sedimentary rocks and metamorphic rocks. Rocks are made from minerals and mineraloids. This composition is tightly bound to form rocks. In addition it may also contain fragments of other rocks. It is a bound aggregate of its constituents which means that it possesses structural integrity. There are many different types of rocks which are classified on the basis of their composition. They may also differ in the grain size, color and other features. Silicic or Felsic rocks – These rocks contain high amount of silica, potassium and sodium. However, these are low in calcium, iron and magnesium. They appear white, grey or pink in color. Example granite, rhyolite. Intermediate rocks – These rocks contain moderate amounts of sodium, potassium, calcium, iron, silica and magnesium. The colors of these rocks are darker than felsic rocks but lighter than mafic rocks. The fine grained rocks are dark grey in color. Examples are: Andesite/dacite (extrusive) and diorite/granodiorite (intrusive). Mafic rocks- These are low in silica, potassium and sodium content, however contain a rich amount of iron, magnesium and calcium. They appear dark grey to black in color. Examples – basalt, gabbro. Ultramafic rocks – They are rich in olivine and appear green to black in color. Example – dunite. Metamorphic Rocks – The word metaorphism has been derived from the Greek words meta which means change and morph means form. These rocks are the evolved versions of the rocks whose original mineralogy has gone through phases of changes due to pressure and temperature variations without being into a liquid phase. The original rock that is transformed into a metamorphic rock is termed as protolith. The process of metamorphism takes place at temperatures and pressures greater than 200 degree Celsius and 300 MPa. They are mainly divided into two types- Foliated and non-foliated on the basis of their textures. Foliated – These rocks show wavy bands or planes which occur due to platy or elongated arrangement of minreals. Slate and Schist are examples of foliated rocks. Non-foliated - They do not show wavy bands or plnces like foliated ones. They exhibit colored bands which occur due to minute impurities present in the rock. However, the main mineral does not portray any visible kind of alignment. 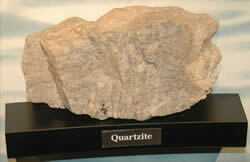 Marble and Quartzite are examples of this kind of rock. Clastic rocks - These rocks are formed by eroded rocks which settle out of water or air. The rocks are broken due to weathering which can take place under the effect of wind, rain , etc. Examples – sandstone, mudrocks. Chemical Sedimentary rocks – They are formed from chemical or elements which get mixed or dissolved with water. Evaporation takes place which leaves behind deposits of these chemicals. Examples– halite, rock gypsum. Organic sedimentary Rock – These rocks are formed due collection of plant matter. It is known as the organic type as the accumulation of sedimentary debris must be caused by organic process for these types of rocks. Example- coal.